New construction - to be completed of Spring 2019, selection of colors, flooring and other interior fixtures can be changed based on building schedule, award winning builder. $60,000 pool allowance, overlooking hole #5, Full summer kitchen with grill, refrigerator and sink. 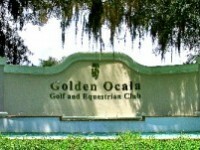 Must acquire Golden Ocala membership.